One of the most popular designs in tattoo art is the arrow tattoo, which has been loved by tattoo enthusiasts since a long time. The simplicity of the arrow tattoo is its biggest plus point, which makes it a good choice for the first timers as it involves less money, time and pain. But its simplicity in no way implies that the tattoo is less attractive than other tattoo designs, which is the reason why it is regarded as one of the best options for both men and women. Moreover, arrow tattoo designs can be done in big or small sizes and look good at any location on the body, depending upon the size of the tattoo. At the same time, this design exudes a symbolic meaning making it a preferred one. Like all other tattoo designs, the arrow tattoo too has its own symbolic meaning, which needs to be understood before one opts for this tattoo. In the Native American culture, the arrow is considered as the weapon of protection and hunting, which has been used to safeguard one’s family as well as sustain them by making provision of food for them. In this culture, two crossed arrows also depict friendship, which is the reason why this symbol is a popular tattoo designs for friend.Another meaning associated with the arrow is that it stands for love as in Cupid’s arrow, which made people get attracted towards each other and fall in love. It is also considered as the symbol of masculinity, strength, power and sense of direction. It is about moving in only one direction, which is forward, without looking back in life. An arrow tattoo is formed by simple lines done mostly in black, though colors may be used in some cases depending upon the choice of the bearer. 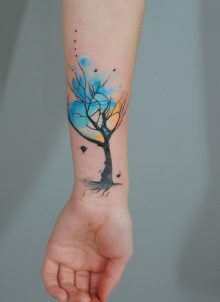 Basically, it is the size of the tattoo which determines its placement. A small sized arrow tattoo can be inked on the wrist, ankle or finger.Here are our 15 Ideas Of Small Arrow Tattoos.Enjoy and get inspired!! !